Goodreads Summary: Natasha: I’m a girl who believes in science and facts. Not fate. Not destiny. Or dreams that will never come true. I’m definitely not the kind of girl who meets a cute boy on a crowded New York City street and falls in love with him. Not when my family is twelve hours away from being deported to Jamaica. Falling in love with him won’t be my story. Review: I absolutely loved Nicola Yoon’s debut novel, Everything, Everything so I was really excited to read her latest book. I mean, look at that cover too! So gorgeous. I ended up letting it sit on my shelf for a few months before finally picking it up a few days ago. It took me quite awhile to get into this book, nearly 50%. I didn’t really feel connected to either Natasha or Daniel. The whole instalove part of this story just did not click with me. The way the story was told was a bit odd as well. It bounced back and forth from Natasha to Daniel with little interlude chapters about either their parents or other people the two of them interact with. I did like seeing how all of the stories connected though, especially with Irene. One thing that really bugged me was how Daniel’s brother Charlie would talk. Many. Of. His. Lines. Were. Written. Just. Like. This. He was a total jerk anyways so not a huge part of the story. Overall it was a cute story but it just didn’t feel like anything special so I didn’t like it as much as I hoped I would. I think it’s still worth a read if you like contemporary romance YA books but I don’t know if I’ll ever read it again. 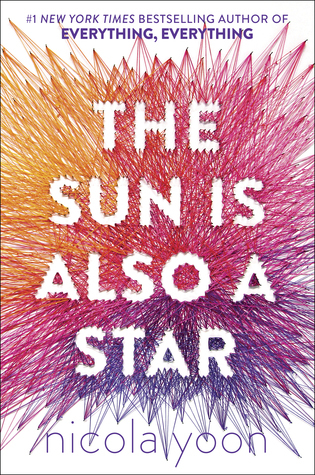 This entry was posted in Book Reviews and tagged book review, Nicola Yoon, The Sun Is Also A Star. Bookmark the permalink. I loved this book, but I still haven’t read the first book. Great review!